Between 1808 and 1814 the MS B text was "cannibalised" by Wordsworth with sections of it being appropriated for, and finally published within, The Excursion in 1814. Such activity should be understood, however, within the context of the entire Recluse project, for which different blocks of text seem to be held "floating" within the larger structure as a resource that Wordsworth draws upon when he finally constructs a whole long poem. The poem was first published, in a free-standing form, by Macmillan in 1888 (Macmillan appear to have rushed publication in order to pre-empt William Knight [see Darlington, 456-458 on this]). Home at Grasmere (MS D) was then given, in full, in Chapter XIV of William Knight's Life of William Wordsworth (I, 232-254) in 1889. On the one hand, Knight was eager to present this material to the world but, on the other, he denigrated it even as he did so: "Future editors may find it desirable to make 'selections' from this canto, but in this edition the 'Home at Grasmere' will stand untouched, and without comment" (I, 231-232). The poem first appeared in a scholarly edition, in 1949, within Poetical Works V, prepared by Helen Darbishire. The title page gives the contents of Poetical Works, V, as "The Excursion" and "The Recluse: Part I, Book I" thus appearing to give some prominence to Home at Grasmere. However, this is offset by the fact that within the volume itself, the poem is not placed in equal standing with The Excursion but given as "Appendix A" along with other appendices for fragments of verse and "The Tuft of Primroses" at the back of the volume (p.313-339). Even such a brief outline of the text's publishing history reveals the importance and value of the Cornell edition of 1977 for changing attitudes to this text. Only at this point was the material able to be valued as part of and apart from The Recluse project and only at this point was the earlier manuscript version of the poem uncovered. All previous editions presented the reading text as that of MS D. Cornell presents parallel reading texts for MSS B and D, allowing access to MS B, the full fair copy of the work, for the first time as it existed before the appropriation of material for other parts of The Recluse. This website is hugely indebted to the Cornell edition of Beth Darlington as well as to the research of John Finch which informed that edition. 1. As an appendix to another major work: The Prelude (in collected editions) or The Excursion. 2. Contextually, as a text to be selected from and used to illuminate another text and one which needs to be understood in the context of the time and place of writing. 3. Separately, as the first book of The Recluse but as a work standing alone. This manuscript page makes clear the way in which the poem is both part of a larger whole, and yet has a distinct identity within that whole. For the poet himself, and for subsequent readers in the nineteenth century, the first identity dominates. This material represents part of a major work that was never completed and it exists within a pool of resource out of which (in part) The Excursion is constructed. From this perspective, as "The solitary canto of the projected Recluse" (Knight, Life, vi) the poem tends to be defined as a "failure" and certainly loses any distinct identity of its own. 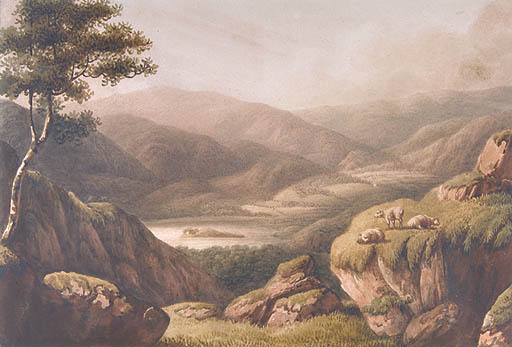 However, if we respond to it not as "The First Part of The Recluse" but as "Home at Grasmere" then it can be appreciated as a celebration of Wordsworth's arrival in the place that was to produce his finest poetry. This perspective allows us to appreciate the poem in its own right, independent (though not forgetful) of the Recluse context. It should be borne in mind, however, that the concept of the work as a single distinct entity is largely a twentieth-century editorial construct. It is based upon the existence of the text in two fair copy states – the author clearly has attempted twice over to construct it as a unified piece – but the title of the poem as a distinct work was not given by the poet himself and there was no attempt to publish it until 1888, long after Wordsworth's death. Nevertheless, the construction of the text, by Cornell, allows for a fuller, richer, more generous interpretation of the text than has previously been possible.